Chief Complaint: "Bulging left eye"
History of Present Illness: A 36 year-old female presented to the Oculoplastics Service stating that her left eye was "bulging" and appeared swollen. She first noticed this approximately one month prior to her visit and felt that her symptoms were gradually worsening. She had experienced occasional headaches but denied any vision changes, eye pain or diplopia. 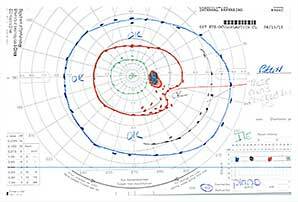 Ocular motility and alignment: Full OU. Orthophoric. Exophthalmometry: 16mm OD, 22mm OS (base 93mm). See Figure 1. 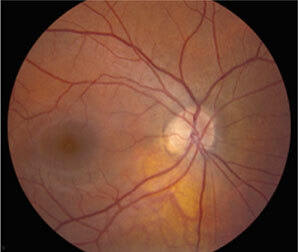 Dilated fundus examination: See Figure 2. The patient�s findings were consistent with a left sphenoid wing meningioma. She underwent a left pterional craniotomy with sphenoid wing meningioma resection and decompression of the left optic nerve. Histopathological analysis confirmed a chordoid meningioma (WHO grade II) with subtotal resection. On her one-week post operative exam, the patient complained of a left upper lid droop and the sensation that "her blind spot" was "a little more noticeable." The patient�s post-operative findings were noted and she was given additional time for further recovery. 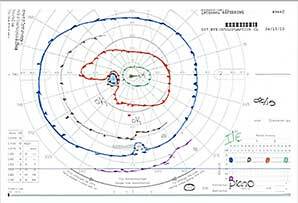 On her one-month post operative exam she felt that her vision had remained stable since the surgery, but continued to be bothered by "grey spots" in her vision inferotemporally. Left upper lid ptosis, RAPD, and V1 hypesthesia remained stable. 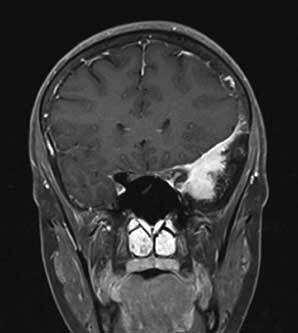 Meningiomas are tumors arising from the meningothelial cells of the arachnoid layer of the meninges. They represent approximately 4% of all intraorbital tumors and 20% of all intracranial tumors. 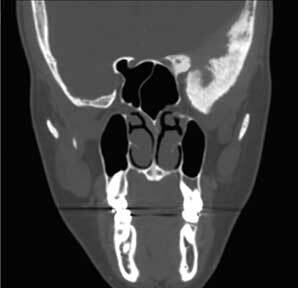 Orbital lesions can be primary lesions (i.e. 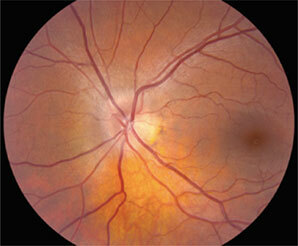 optic nerve) or secondary lesions (i.e. extension from adjacent structures). * The WHO Classification of Tumors of the Nervous System. J Neuropathol Exp Neurol, Vol 61, March 2002. 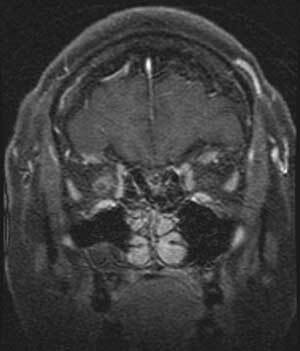 These lesions tend to grow circumferentially around the optic nerve (see Figure 7) and are difficult to resect without nerve compromise. Histologically they tend to be of the meningothelial and transitional pathological subtypes. The prognosis for survival is good with essentially no mortality. However, the prognosis for vision is guarded with many cases leading to progressive visual loss. Treatment options vary with close follow-up and periodic imaging often advocated for 20/40 vision or better. Surgical options are limited and biopsies are becoming more uncommon in part because of associated morbidity. Optic nerve sheath fenestrations to decompress the nerve are of historical interest only and can lead to massive orbital invasion of tumor. En bloc resection may be considered in cases of poor vision. 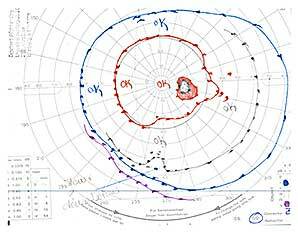 Finally, radiation treatment is considered when there is evidence of progressive optic nerve compromise (visual acuity, visual field) or definite tumor enlargement in non-diabetic patient. It is delivered via 3-dimensional stereotactic techniques in order to minimize side effects. Treatment options vary by individual case and include surgery, radiation, and close observation. Surgery is considered for any patient with a symptomatic or growing tumor. The goal is either complete resection or to stabilize the tumor or symptoms. Surgery employs combined neurosurgical and oculoplastic participation and often includes decompression of the optic canal. Nevertheless, these tumors are difficult to manage surgically because of their close proximity to vital structures such as the optic nerve and the internal carotid artery. 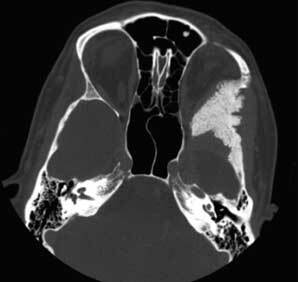 Diffuse involvement of the skull base often increases surgical complexity. Debate continues as to whether surgery leads to better results than the natural history of the disease, and reported surgical outcomes vary. Visual function testing may demonstrate results ranging from mild improvement to continued deterioration. Exophthalmometry readings also vary, but the majority of patients show stable to improved measurements. Surgical follow up includes monitoring with yearly imaging studies. As suggested above, various factors are reviewed when contemplating radiation treatment. These include the extent of surgical resection, tumor grade and histological subtype. Radiation is usually reserved for tumors that are rapidly progressive despite surgery or are histologically atypical. Shrivastava et. al. do not recommend post-op radiation for all patients with residual tumor but do advocate repeat surgery for recurrent tumors followed by post-operative radiation. 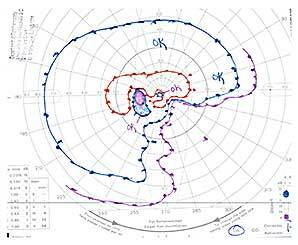 The patient in our case received post-operative radiation based on the tumor grade and histological subtype. Cannon PS, et al. The Surgical Management and Outcomes for Spheno-orbital Meningiomas:A 7-year Review of Multi-disciplinary Practice. Orbit 28(6), 371-376, 2009. Deepali Jain, MD et al. 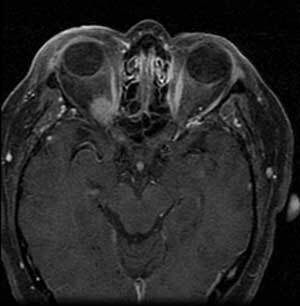 Intraorbital Meningiomas A Pathologic Review Using Current World Health Organization Criteria. Arch Pathol Lab Med. 2010 May;134(5):766-70. Dutton JJ. Optic Nerve Sheath Meningiomas. Surv Ophthalmol. 1992 Nov-Dec;37(3):167-83. 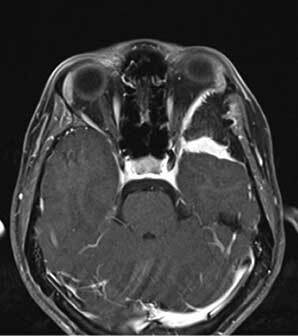 Turbin RE, Pokorny K. Diagnosis and Treatment of Orbital Optic Nerve Sheath Meningioma. Cancer Control. 2004 Sep-Oct;11(5):334-41. Review.